We operate at the heart of nations bursting with innovation, creativity and new ideas. We will continue to champion positive change. We are not First World or Third World: Welcome to the New World. Driven by its pioneering approach, MTN is a leading emerging markets mobile operator which is at the forefront of the technological changes sweeping the world. 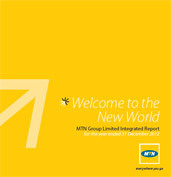 This integrated report is MTN Group Limited’s (MTN, the “Group” or “Company”) principal report to stakeholders and includes information on our governance, strategy, performance and prospects, seeking to provide a balanced account of key developments in the period 1 January to 31 December 2012. We have endeavoured to provide a clear and concise story of how MTN creates value over time, and have taken into account the latest prototype framework of the International Integrated Reporting Council. The report also gives information on how we are addressing social, economic, environmental and governance issues that are important to our stakeholders and have a material impact on the long-term sustainability of our business. To define the report content, we followed a structured approach, which included input from a broad range of key MTN representatives. This included representatives of the board, the executive committee and departments including Group strategy, company secretary, stakeholder management, investor relations, sustainability management, risk management, finance, marketing, human resources and corporate affairs. © 2013 Mobile Telephone Networks. All Rights Reserved.